The truck with ladders obscures the stop sign on the north side of the 8th and C intersection next to the Hine site. The required flagman is not present. Staging on 8th Street, SE. One of the two entrances to the Hine site is at 8th and C, on the right in the photo. 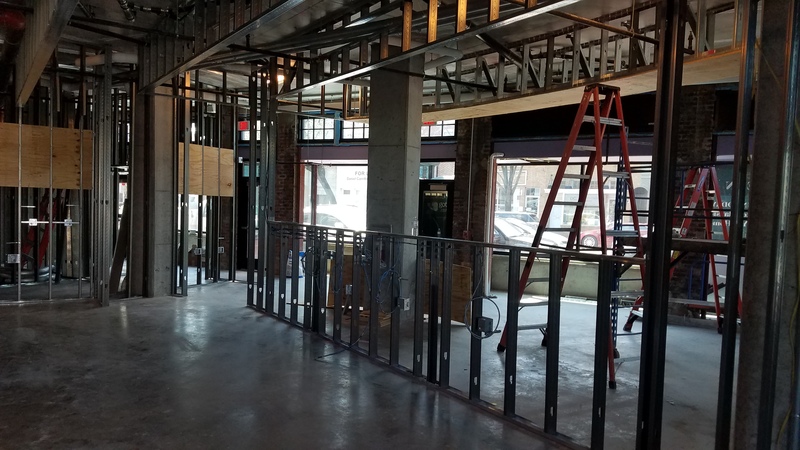 View of the Hine construction entrance from the north side of 8th Street, looking south. Truck on left obscures stop sign. According to nearby residents of the Hine project, some critical construction traffic and safety provisions – agreed to by developer Stanton Eastbanc (SEB) – are being ignored by the contractor – Clark Construction. 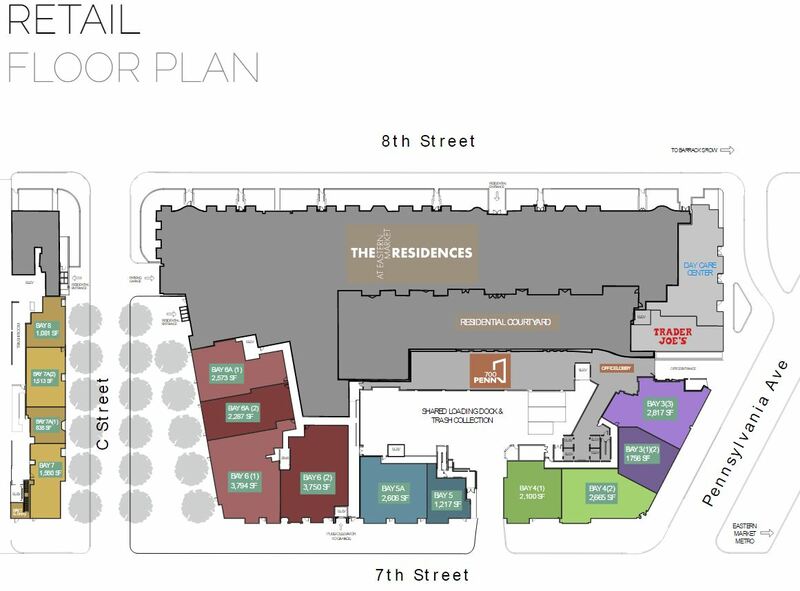 The provisions are detailed in the Construction Management Agreement (CMA) hammered out with SEB by ANC6B and neighbors * most affected by the development. 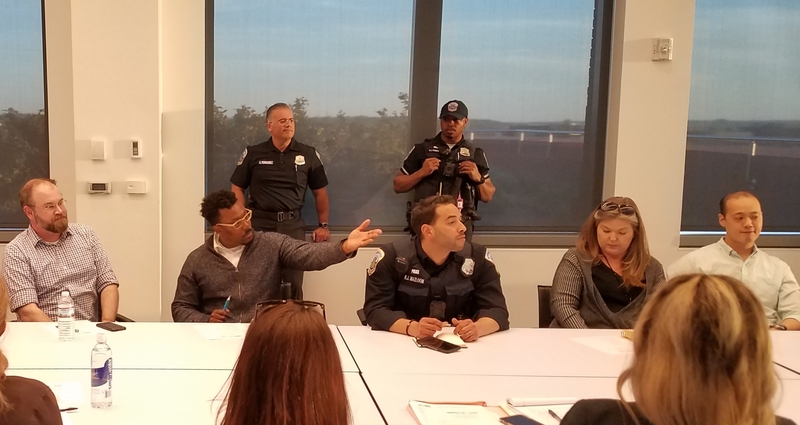 Those neighbors have been organized as the Citizen’s Advisory Committee (CAC) which meets monthly with the developer and the contractor to discuss construction management issues. 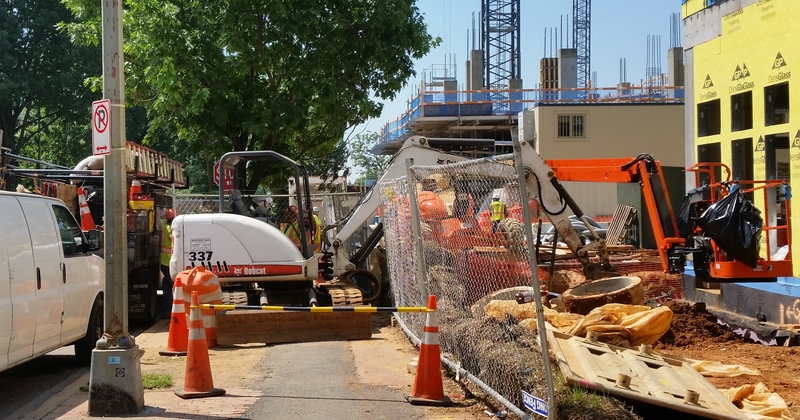 Part of the reason for the unhappiness is that the DC Department of Transportation (DDOT) appears to have given the contractor the benefit of the doubt on construction traffic issues at the expense of the neighborhood. Moreover, neighbors worry that if the heavily negotiated CMA is not getting due diligence, whether there is a chance that one of the chief community benefits the developer has pledged might be at risk. (In return for zoning changes to allow greater height and density than city regs would otherwise allow, the developer agreed to provide certain benefits and amenities to the community as compensation, those having been detailed in a Memorandum of Agreement (MOA).) Both the CMA and the MOA were included in the zoning order by the Zoning Commission as conditions of the zoning change. 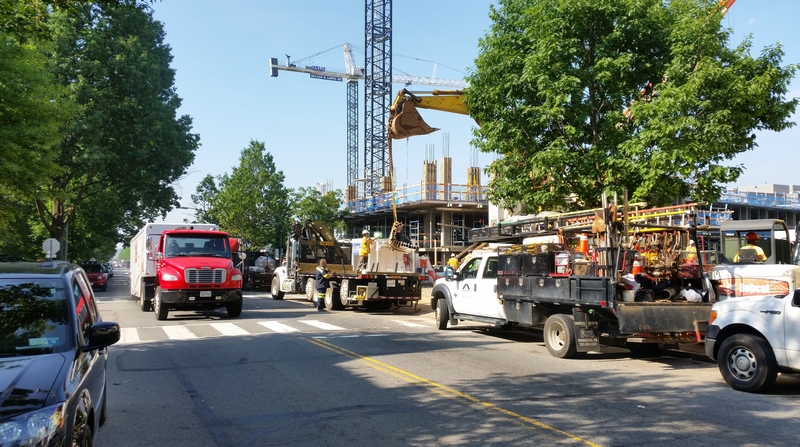 Staging – lining up – of trucks on 8th Street adjacent to the construction site, not only north of Pennsylvania Avenue, but north of the 8th and C Streets intersection. The staging has created a dangerous intersection at 8th and C Streets. 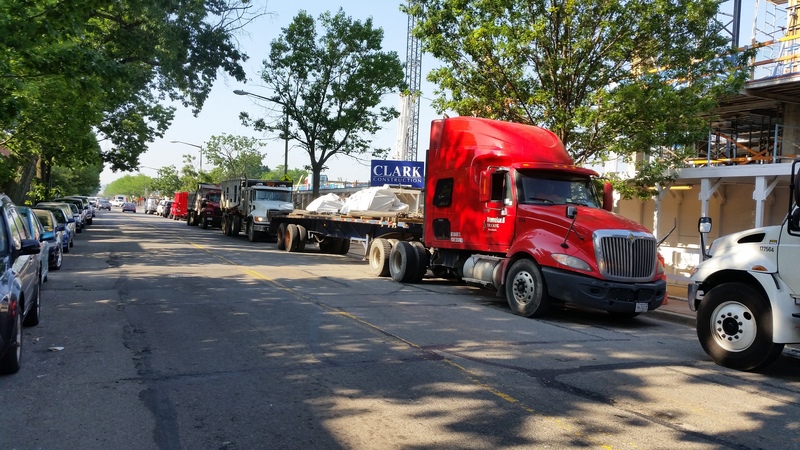 Last week, CHC observed a construction truck which obscured the stop sign on 8th Street the north side of the C Street intersection, and watched as a light truck headed south blew through the stop and across the pedestrian walk without slowing down. No contractor flagman was present to direct traffic as required by the CMA. Construction traffic on C and D Streets near the construction site. Impeding access to the east-west alley between 7th and 8th Streets, on the north side of the site. Working past 7:00pm and receiving deliveries before 7:00am. Some of the concerns like blocking the alley and deliveries before 7:00am and working after 7:00pm, are specifically prohibited in the CMA, as well as a violation of city regulations. Others, such as construction traffic and staging are of equal concern and more irksome owing to what some residents see as the city’s participation in abetting the transgression. That abetting is made possible by a qualifier inserted into CMA language, i.e., “developers will make commercially reasonable efforts” to keep traffic and staging off streets in question. With such an assertion, Clark applied for a staging permit for 8th Street – taking over 25 parking spaces – and was granted one by DDOT. The problem is, say residents, the contractor asserted that they needed 8th Street, but offered nothing to prove they looked at alternatives – raising the question of how meaningful an agreement is when compliance depends on a third party. The permit granted by DDOT allows staging from 7:00am until 3:30pm, but residents say the contractor uses 8th Street for staging until 7:00pm. Residents say it takes hours to get somebody from city agencies to respond to complaints and by the time an inspector does arrive, the issue is moot. Regarding fears that flouting the CMA lays the ground work for disregarding the benefit provisions of the MOA there is the fact that the same qualifying language in the CMA which is causing grief on traffic and staging has been included in the MOA regarding one of the community’s major benefits. *ANC6B, Eyes on Hine, Hine School North Neighbors, Eastern Market Metro Community Association, Eastern Market Community Advisory Committee, and Market Row Business Community. It is my understanding that SEB has been in discussions to house a Child Care Development center at the Hine Site. ANC 6B Commissioner is also aware that at least one other local organization has expressed interest in the site. As such, it would be extremely disappointing if a Child Care Center was not houses at the Hine site. I would not have signed on on these weasel words. Thanks again for your good work. Have city officials or our representatives responded to this point? This has always been a problem, and not particularly tied to the construction. When the flea market was operating there, people would park trucks for pick ups and drop offs, and block the stop sign. In fact this is a city responsibility — they should double up the stop signs, to eliminate this issue. Wouldn’t cost much. I second this. I live a block away and see trucks/tour busses/other vehicles obscuring the stop sign all the time. Moreover, people don’t stop there even when the stop sign is not obscured. This intersection needs a camera to enforce the stop signs. I saw the workers swinging a load of pipes literally over pedestrian’s heads (like a few feet above) on 8th st. It looked REALLY dangerous. Well, have they used any “commercially reasonable” efforts yet to find a tenant? This seems like something that could be verified easily. There are at least two big national daycare chains (Bright Horizons and Nobel Learning) that might be interested. There are established neighborhood providers that might want to lease a new space. What is the definition of “commercially reasonable efforts” to find a daycare tenant? Does it mean a certain amount of rent? Does it mean a certain length of lease? A small, local provider might use that space very well, but may not be able to compete for rent and lease length with a national daycare provider–which in turn might not be necessarily attracted to a space of that size. Maybe every daycare siting follows this process, but for me, the local need for daycare is so deep that it seems a shame that there is the distinct possibility that no daycare will ever go in there.